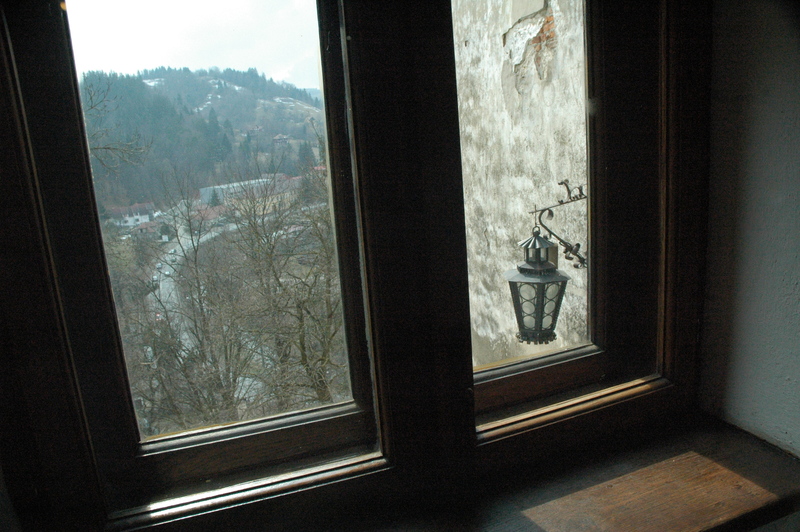 Last weekend I accompanied two friends and fellow Central European Teaching Program members – Rosti and Carlyn – to Brașov and Bran. Prior to departing, Carlyn and I packed things for us to do: she was to knit a scarf and I had planned to seal our bond in thread by making friendship bracelets. I also brought Barack & Michelle: The Love Story to read. During my 26 hours on the train, I only got a fourth of one bracelet finished. I mostly just played Hungry Shark Evolution, one of my mother’s favorite games, on my iPhone. Not a day goes by that I don’t regret leaving my Gameboy Advance at home – Pokémon and Zelda, we’ll be reunited one day. The train ticket was supposed to only cost us $40.38/€38/11.560Ft roundtrip, but Carlyn and I missed the deal and ended up paying $64.79/€61/18.560Ft. Apparently deals are only good if you buy tickets three days in advance. 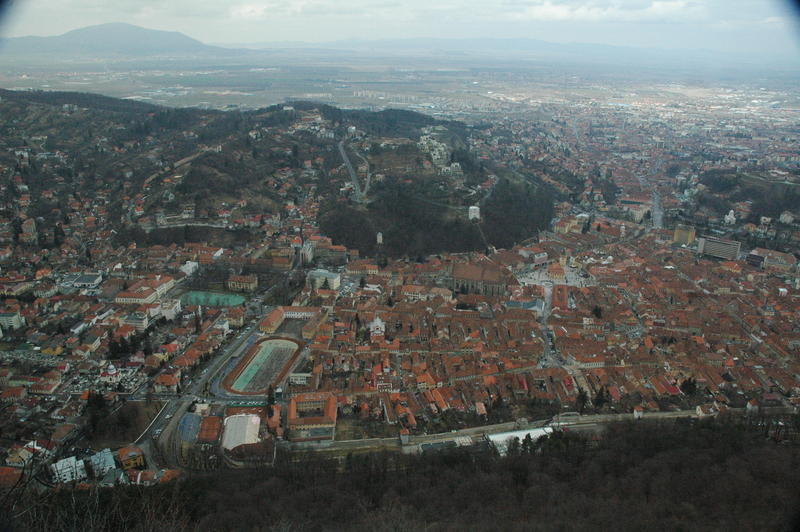 Upon arriving in Brașov, we sought out a taxi to take us to our hostel. I had read online that taxis were cheap, so instead of trying to navigate the town with our backpacks, we planned on hailing a taxi. My friends and I were immediately approached by a taxi driver who kept saying “70 Lei! 70 Lei!,” which is $16.72/€15,75/4.790Ft. We instantly knew he was ripping us off, but at the time didn’t realize by how much – a ride should have only cost us 10 Lei ($2.39/€2,25/685Ft). Rosti, Carlyn, and I turned down the aggressive rip-off and hopped on a city bus. Each ticket costs only 2 Lei ($0.48/€0,45/135Ft). Pro tip: take the bus. After throwing our bags down at the hostel (Kismet Dao Hostel), we made our way to Castle Bran. We took a bus from Bus Station 2 (Autogara 2 – stadion) to Bran for 14 Lei ($3.34/€3,15/958Ft) roundtrip. To the blonde-haired, blue-eyed Romanian man I made eye contact with on the bus – feel free to marry me one day, okay? On the way to Bran. 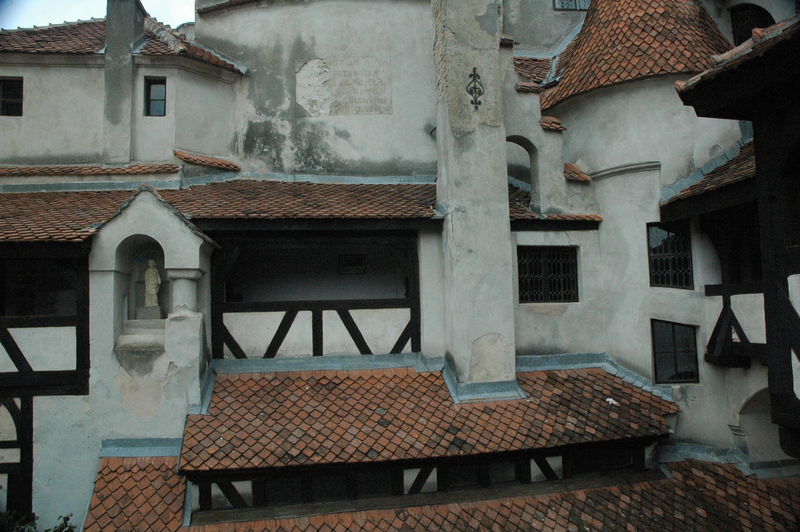 Bran Castle, known as “Dracula’s Castle,” is the top tourist destination in Romania. Cheesy vampire memorabilia littered the premises. I have wanted to go to Dracula’s Castle since 1997 – the year I got Castlevania: Symphony of the Night for the PlayStation (still one of my favorite video games). I might have been a student when I paid for admission – it also might have only cost me 15 Lei ($3.58/€3,37/1.025Ft). Who knows? All I know is that adults have to pay 30 Lei ($7.16/€6,35/2.250Ft) and that is too expensive for my poor, traveling teacher life. 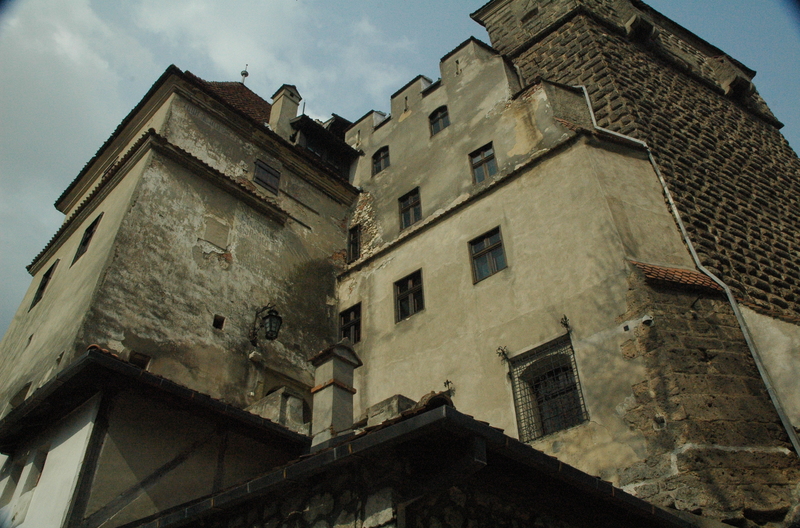 The history of the castle dates back to 1211. 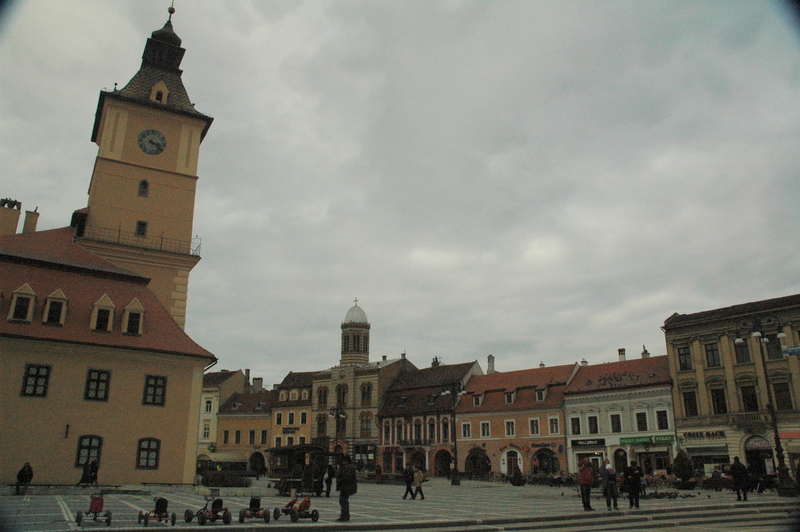 The Teutonic Knights erected a fortress in Bran after being given land by the Hungarian king at the time – King Andrew II (II András király). Many people forget that this region of Romania actually belonged to Hungary until the Treaty of Trianon in 1920. The castle gained fame after Bram Stoker wrote Dracula in 1897. 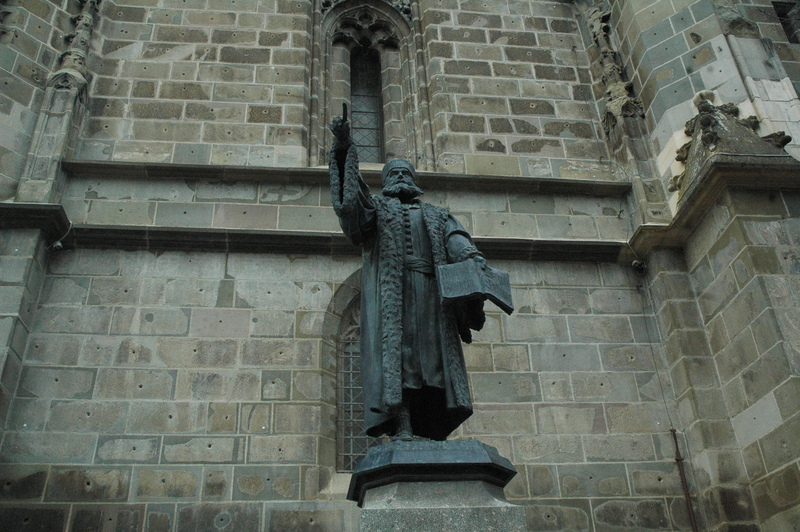 Although the character Bram Stoker created is fictional, people saw similarities between him and Vlad III, Prince of Wallachia: “The association between Count Dracula, the vampire imagined by Bram Stocker, and the historical character Vlad Tepes the Impaler, prince of Wallachia (1448, 1456-1462, 1476), who spent his childhood in Transylvania, is due to the bloodthirsty and punitive character of the voivode.” Click [here] to read the rest of the history of Castle Bran. After walking around the castle (and peeing in the bathroom), we hopped back on the bus. 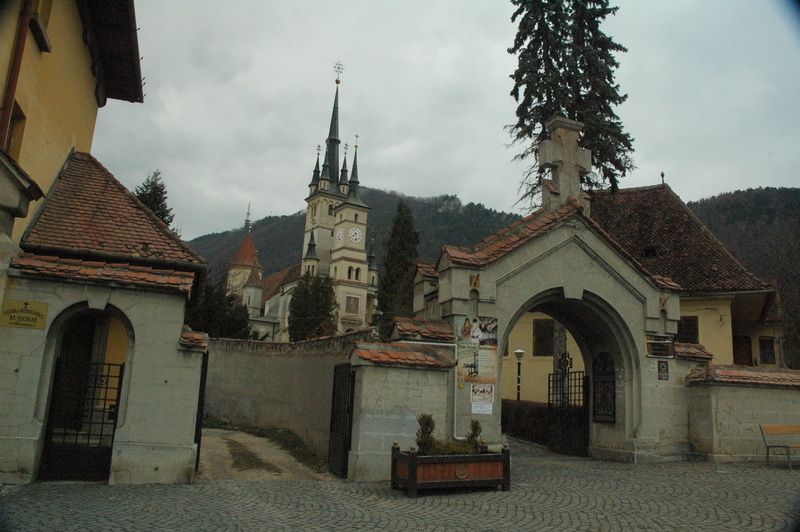 Rosti, Carlyn, and I considered going to the Râșnov fortress (just two stops from Bran in the direction of Brașov), but decided against it due to weariness and the lack of funds. The desire to be horizontal was stronger than many other things we have experienced. Crawling into our beds, we took a short break before going out to dinner at a nice restaurant called Sergiana. I never eat well when I travel (with the exception of the trips taken with my older sister, Maricel, who lovingly buys me food I cannot afford), but am glad I joined Rosti and Carlyn for dinner. 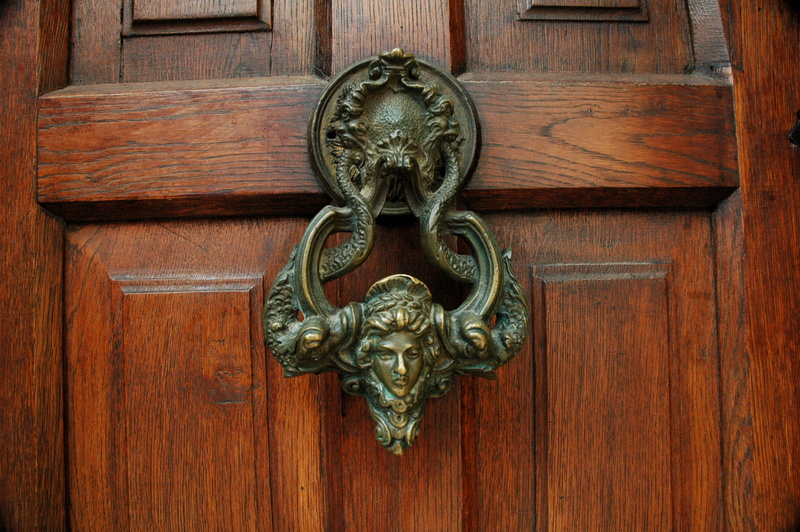 Pro tip: Make a reservation at this restaurant – it was quite popular. After a half-hour wait, we were seated in the non-smoking section of the restaurant. That’s right: smoking is allowed in basically every establishment. I absolutely abhor everything about cigarettes. Carlyn and I got a traditional Romanian dish called Sarmale: minced meat rolls in cabbage leaves dressed with bacon and polenta. My meal (plus a small still water) cost 28 Lei ($6.69/€6,30/1.920Ft). The dish was very similar to the stuffed cabbage (töltött káposzta) I eat in Hungary. The next morning our first stop was the crest of the Tâmpa mountain, which has huge “Hollywood letters” spelling out Brașov at the top. Instead of hiking up, we paid 16 Lei ($3.82/€3,60/1.095Ft) for a roundtrip chairlift ticket. The short hike to the letters once at the top was super muddy and slippery. 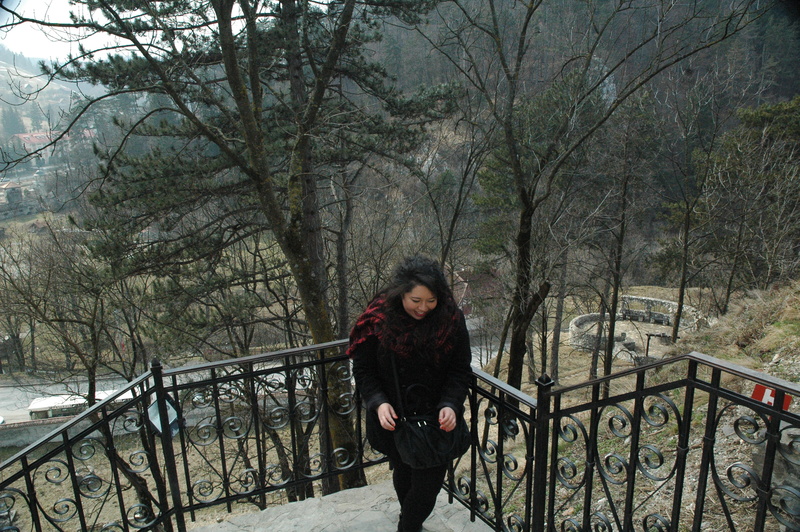 I kept having flashbacks to my Slovakian mountain-climbing-experience where I almost fell down a mountain. The view of the city from above was fantastic. Next we explored the city center. 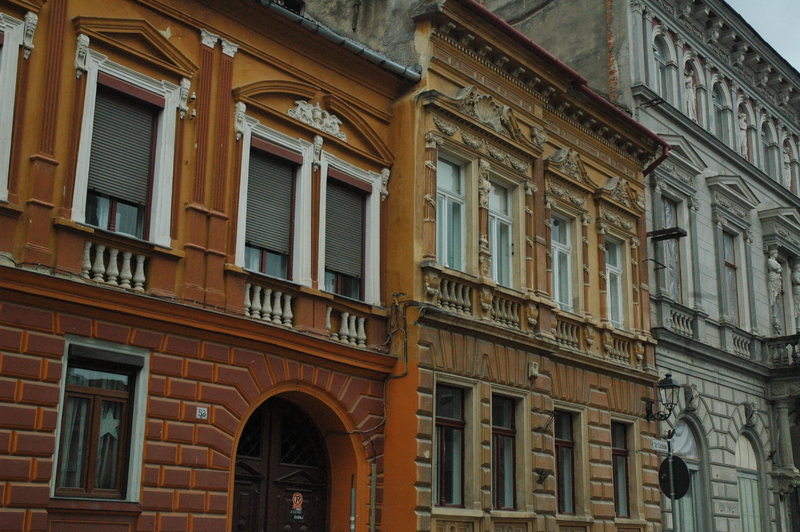 The decrepit buildings are all different styles and colors. 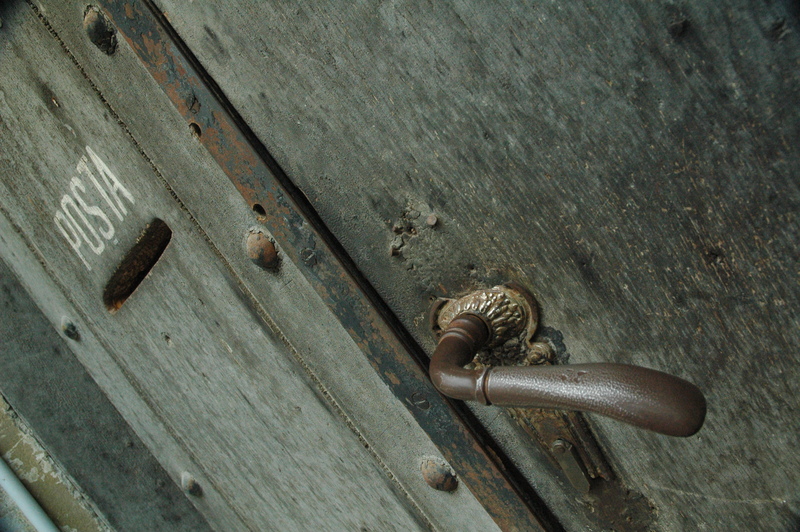 I have an obsession with doors and Brașov treated me well in this regard. 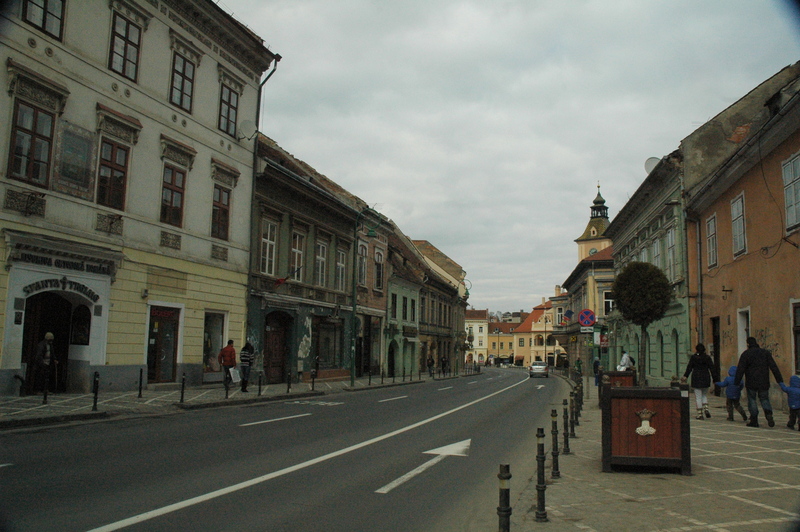 A great street to walk down is Strada Castelului – the following pictures were taken there. 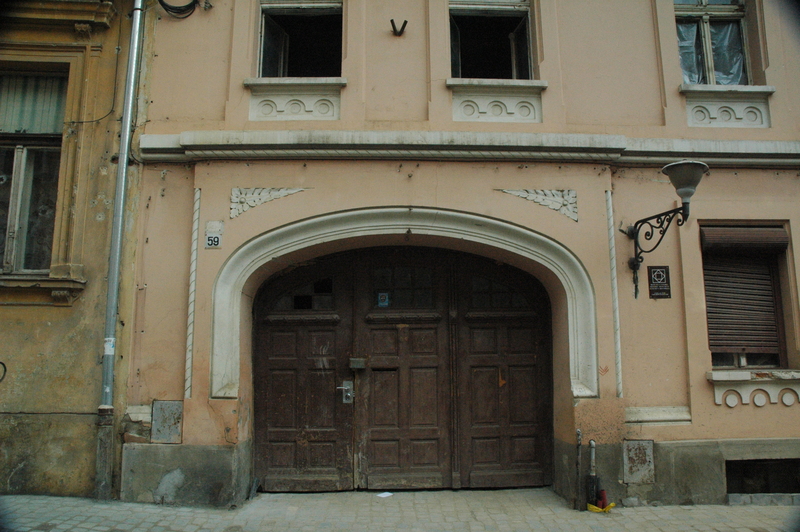 Brașov is home to what is believed to be the narrowest street in Europe – Strada Sforii (“String/Rope Street”). I am 5’2” on a good day and my short legs could touch both sides at the same time. If my legs were as long as my torso, I would be probably be two inches taller. Legs for days? Will never apply. 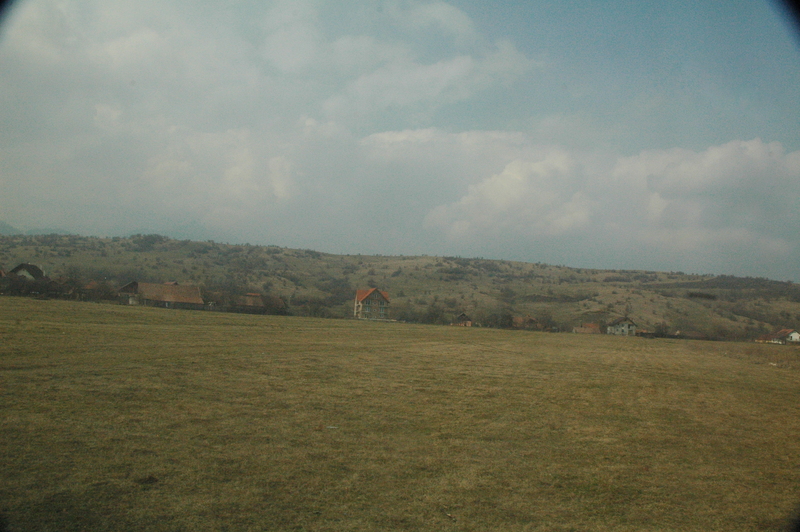 Rosti, Carlyn, and I walked around the birthplace of the Romanian national anthem for a couple more hours – seeing Romania’s first school, creeping a cemetery (surprise, surprise), working out at a playground – before first returning to our hostel then getting on the train. The train ride back was much better than the ride there, although we were all just as wildly bored. I also upgraded to a Tiger shark, which is borderline exciting. 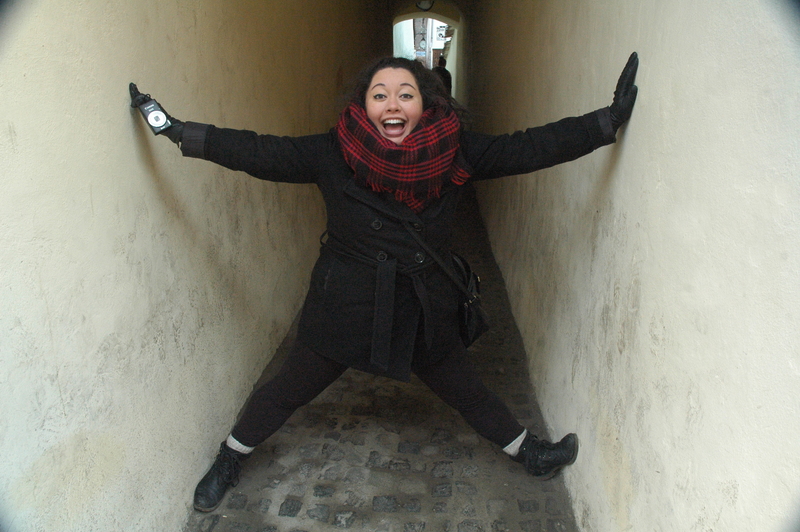 Overall my trip to Romania was short, but great. I might have spent almost as much time on the train as I did in the walking around, but it was worth it. A Lesson From Miss Jennifer: Save yourself from heartache – buy your train tickets early! I don’t what more “hook-y” to read -the Dracula story or the train ride. 🙂 Love all the pictures. And I thought Greece, Spain, and Italy have roads too narrow to drive through, I was obviously wrong. Romania is one of the places my employer can send me too. Romania sounds so nice. Ah! I never responded. Romania was awesome! If you go, I am sure you will like it. Oh, I know those eternal train rides. You think we’d be used to them living over in these parts. FYI -the Orangeways bus that goes from Budapest to Romania is worse. So cramped. No toilets. Just in case you’re considering another trip to Romania one day. Last summer I almost took an Orangeways bus to Romania. I am so glad I didn’t. Having the ability to walk around if needed was definitely a blessing.